Wampee Stables is a family friendly western horse farm that is owned and operated by Debbie & Richard Parker and their daughter Warner who got her first horse at the age of 4. 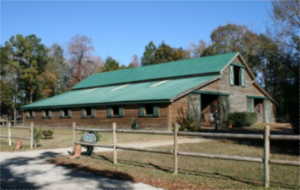 The farm is situated on land located just outside of North Myrtle Beach, SC and is the home to over 35 wonderful horses. The farm has been in Debbie’s family for over a century. Raised on the farm, Debbie has established a relationship with the horses that includes understanding, commitment and respect between her and her horses. Everything about this farm and stables has been designed and managed to offer the horses the highest level of comfort. Wampee Stables offers trail rides year round. Our stables offer a riding experience that is not only educational but is also just down right fun. Fun for the whole family from young children to grandparents and everyone in between. Come ride with us at Wampee Stables and find out why locals and visitor to the North Myrtle Beach, SC area say that Wampee Stables is a “must do” Myrtle Beach, SC area attraction. The land that Wampee Stables is situated on was brought into the family by a local teacher, farmer, shop owner & mail carrier named Oree Jerome Bell (Debbie’s Grandfather). The photo to the left shows Oree beside his mail carriage, if you look closely above the rear wheels you can read the words Wampee SC. Wampee Stables is situated on a portion of the original 2000 acre tract of land that was acquired by Oree and two of his brothers. This land was originally known as the N.F. Nixon Estate. Oree had sold a 346 acre tract of this land to the Tilghman brothers in 1926 and that is now known as Tilghman Beach. Around 1900 a tram railroad crossed this land that traveled from Little River to Conway to transport Cypress timber harvested on this land. The railroad was built by The Gardner-Lacy Lumber Co. the previous owners of the land. Additional history about Wampee Stables and the family farm is available at the stables. *All riding activities are by appointment only, so please contact us for a reservation in advance. Gift Certificates are available at the farm and online at this website.